Ce4T-901 Clearomizer - The new ego tank Ce4T-901 clearomizer works with the tgo batteries series. For user that are using the Dse901 as thier base and powering the 901 atomizer with a tgo W batteries that are base on the Dse901 thread now can use the Ce4T-901 clearomizer. 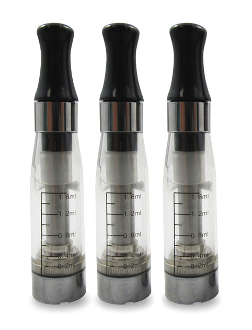 The eGo Clearomizer tank system is easy to refill. They are manufactured from thick durable tank style plastic and has no burning smell or leaks. A Ce4T Clearomizer made especially for TGo batteries. A new alternative, to vaping with tanks and atomizers, for the TGo battery. It is easy to fill and has a 1.6ml capacity. With sturdy, durable construction, you'll have many hours a fantastic vaping ahead. See our selection of TGo batteries available for lots of fun colors and designs, for your vaping pleasure. Works with 901 thread: TgoW, Tgo, Not compatible with eGo batteries. See our eGo Clearomizer section for eGo parts and accessories.